The whole herd (except for Xadaa) is either sleeping or meditating. At the beginning of this livestream video (below), we just catch the tail end of Aude, Kaliah and Zorra’s nap. They all went into deep sleep, leaving me to stand guard (scan for coyotes or other threats). I’ll never forget the first time the original herd of 5 trusted me to be the sole sentry and all lay flat out in REM sleep – it was a tremendous privilege and one I took seriously. When I first went out to the field, only Aude and Zorra were lying down and Kaliah was standing guard. After I’d stood there quietly for a few minutes, I guess Kaliah decided she could hand the job to me and she lay down too. 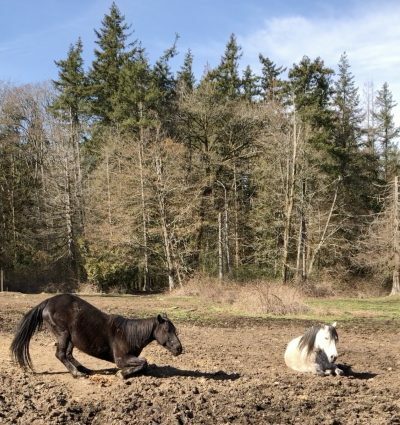 Within minutes she was flat out in REM sleep; with her eyelids flickering and hooves occasionally making “running” movements – she must have dreams like my dog Tiah. Aude was also flat out and snoring away. So I stood watch and scanned the field for any coyote movement. The rest of the horses were in the barn. I have a lovely exchange with sweet Posa – her fur is the softest of anyone here, but I don’t allow myself to touch her, as that would break her meditation and be annoying. So I study her darling muzzle instead and exchange breath. But. Even though she is not moving, deep in meditative state, watch at 2:30 minutes when I move my leg, and then she moves her leg to mirror mine exactly. Her body shows how connected we are. Makah-Mahpee lies down to nap as I am walking towards him – when my body is full-frontal to him (assertive) thus showing me how much he now trusts me. Ahhh that makes my heart very glad to see how far we’ve come. I then meditate for a bit, sitting in between Siyone and Cobra – the two ‘wildest’ mustangs. I wish the camera had moved to catch how relaxed and soft these two were with me so close, but perhaps that movement would have disturbed them, or put pressure on them by coming closer. It’s all good. Not much happening in this video… and at the same time, wondrous things are happening! It just depends on which level of perception we’re using. ← Will all our Trailer Play Hold Solid in a Crisis?